The summer is approaching and with that my second leg of the research of my trekking guide “Trekking in Tajikistan and the Afghan Wakhan Corridor”. Today I got my 2 months visa! In July I will travel to Tajikistan with my friend Pete Wooding, to start the first 10 day trek in the northern part of the country. We’ll be doing an east to west traverse of the Zerafshan Range, with several passes over 4000m. The starting point is at a small village called Langar, on the Zerafshan River. This is the entry point of the Tabaspin Gorge leading to the 4040m high Tabaspin Pass. After that it’ll take four days to reach the road. By following the river Yagnob downstream and climb the Khishertob Pass (4011m) we hit the M34 at Takfon. The second stage starts near Iskander Kul, in the village Sary Tag. 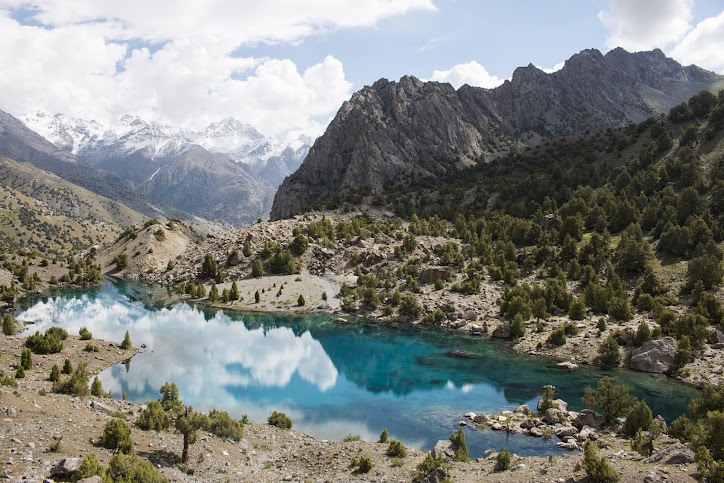 A three day trek via the less known Sarymat Pass (4160m) and the Tavasang Pass (3300m) takes us to the famous and stunning 7 Lakes at Marguzor Lake. Here we take a bus or hitch a ride to the “metropolis” Penjikent for some cold beers. The third week of July the north-south crossing of the Pamirs is on the program. Together with Remco Vriend, a friend I met on the Annapurna Circuit in Nepal (and is funny enough from the same Dutch village as me) we will do a 25 day trek from Vanj to Vrang (Tajik Wakhan Corridor). On route we’ll be passing the foot of Pik Revolution, cross a part of the better known trekkers routes in the Bartang Valley, camp on the shores of Yashkul and get close up views of the magnificent jagged mountains Pik Karl Marx and Pik Engels. All this while crossing five passes of over 4500m! An attempt of one of Pik Engels side peaks over 6000m is planned. Straight after that the hot spring at Baba Fatima in the Wakhan is waiting for us (as well as a few more cold beers and decent food in Khorog). From September 2012 I will start writing, designing and producing the guidebook that is planned for publication in 2013!